Mark decided to heed Robin’s advice, and was up at 3:00 this morning for the photo opportunities. 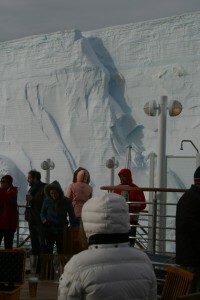 I stayed in the suite, but did get up to watch the ship make its way through the Antarctic Sound. The light really was amazing for pictures. 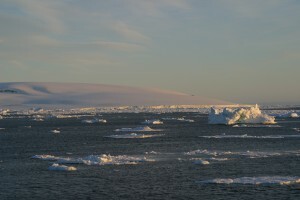 Mark returned after 30-40 minutes and then Robin gave us a wake up call at 7:00 as we passed Seymour Island, and were approaching the edge of the ice shelf near Snow Hill Island. At the edge of the pack ice, the ship can go no farther – our ship is quite capable in the ice, but she is not an ice breaker. 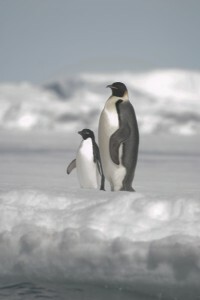 It is on the ice shelf that we have the best chance to see Emperor Penguins. Again, Amundsen was smiling upon us. We sighted 5 Emperors along the pack ice. There were also Leopard Seals, Weddell Seals and Crabeater Seals as well as numerous Adelie (pronounced uh deli) Penguins. This morning we are offered a Zodiac “cruise” as opposed to a ”landing” as there is no land to land on, only sea ice – but, certainly with the chance to get up close and personal with the penguins and seals from the water. Our Zodiac cruise was fantastic – there is nothing like seeing these creatures in their native environment. And, the little penguins are so funny when they suddenly pop right out of the water onto the ice! The animals here in Antarctica have little fear of humans: we don’t make a lot of noise, we don’t chase them around with our boats and we aren’t looking to have them for dinner tonight, so they tolerate us very well. Sometimes they may show a little agitation or confusion when we happen to be in their intended path, but as long as there is no show of intent to interfere with their normal behavior, they ignore us. We returned from our morning cruise for a wonderful lunch on the aft deck. The day was gloriously sunny, and amazingly warm – we didn’t even need our parkas. 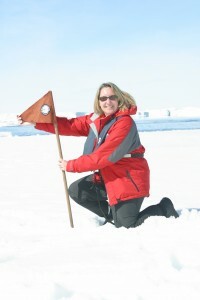 While at lunch, Robin announced that we would indeed have a very special opportunity to go ashore on the pack ice in the afternoon. The Captain had turned the boat and pushed it bow first, well into the ice, and the thought was that from the ice, a picture of the ship wedged into the ice would be perfect. This was an unexpected treat, so we donned our cold weather gear once again and were off in the Zodiacs to actually land on and walk around on the ice. Even the Expedition Team were excited. For the hundreds of trips this ship and crew have collectively sailed in the Antarctic, this is only the second time the Silver Explorer has been wedged into the pack ice. Just to put this in perspective – this is the first time Emperor Penguins have been seen on Zodiac excursions, and this is only the second time in the ship’s history (dating back to 1994) that the Captain has put the vessel into the sea ice. In celebration, tonight’s briefing and recap is cancelled in favor of a cocktail party on the aft deck. 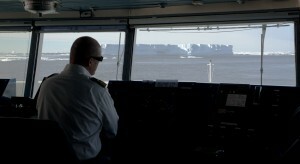 Once again, Captain Golubyev has maneuvered the ship to provide the perfect backdrop – with the stern positioned to look up at an amazing and huge tabular iceberg. WOW !! Having a party right up next to a 200 foot high iceberg is just incredible, especially when you consider that there is another 9 times the height beneath the surface of the water. One of the Expedition team also shared with us that two years ago, the Silver Explorer had the opportunity to enter the Weddell Sea and anchor near Seymour and Snow Hill Islands. The Captain and Expedition Leader on the Explorer made the decision not to attempt the trip at that time, but unfortunately, there was another vessel that made the opposite decision. After they had crossed the Sound, and made their way to the Island, the pack ice closed behind them, and left them stranded for two days. All of that should give you some indication of just how remarkable today was!! Since we didn’t have our usual briefing this evening, Robin informed us over the intercom that we will be headed for a location called Brown Bluff, which sports a major penguin colony. The bad news is that poor weather may be heading our way so we will need to get an early start. This means Zodiac boarding at 5:30am, involving a wake-up at 4:30. As usual, Robin is happy to give us a yell at the appointed hour! A last item before we sign off for the day – one aspect of Silversea that we think is incredible is the opportunities provided to the crew to experience Antarctica. This morning, all staff members, and we mean all ship staff members, from the persons that man the laundry to the bridge officers, were called to the fore decks to view the Emperors. And, this afternoon, staff members were also given a chance to accompany the Zodiacs on both the cruise and the ice landing. Many of these individuals have never seen snow before, let alone walked on the ice and had the chance to throw a snowball for the first time. We think that says a lot about an employer! For someone that you know does not like the cold at all – it all sounds incredible & makes us wish for a minute that we could be there with you two! We wish that too! To be able to share this with those we love would be incredible! !